This review is a condensed review, as this camera is essentially the DSLR-style version of the X-A5, which I've already reviewed. 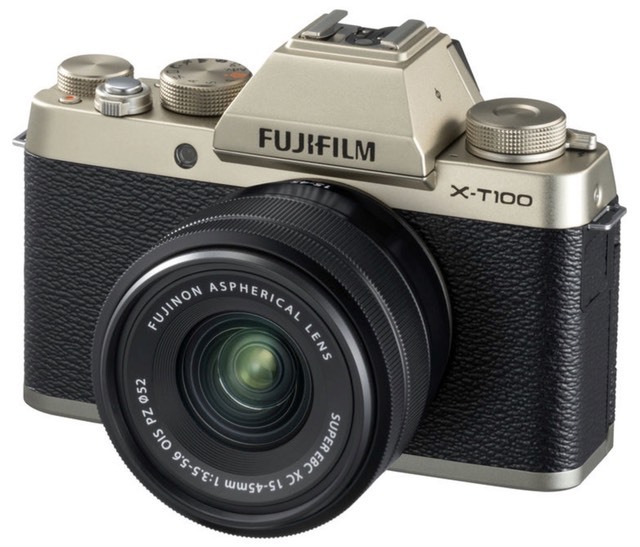 The X-T100 is Fujifilm's entry model mirrorless camera with an electronic viewfinder (EVF). By appearance, it looks like a somewhat diminutive DSLR with a moderately retro look. There are dials, but they're unmarked (top left Film Simulation, top right Exposure Compensation). There's also rear command dial (vertical, just extending up where thumb usually sits. ), and a Mode dial. One programmable function button (top plate), and a diamond array of dedicated buttons where the Direction pad usually goes (AF, self-timer, WB, and drive mode). Inside, the X-T100 is pretty much exactly an X-A5: 24mp Bayer-pattern APS-C sensor that only gets to 15 fps for 4K video (1080P60, though), minimal buffer (26 JPEGs at 6 fps), and a hybrid AF system that uses some phase detect and contrast detect on the imaging sensor. That autofocus system has phase detect over only 40% of the frame, by the way. From shooting experience it's a little slower than you might expect, and it seems to default to contrast detect pretty quickly. While the X-T100 has the same 3" rear LCD as the X-A5, you can tilt that up/down and flip it out 180°. Not quite a fully positionable display, but quite close. Meanwhile, the EVF is a smallish 0.62x magnification on the usual 2.36m dot small display. Both Bluetooth and Wi-Fi are built in, and Fujifilm has one of the better smartphone apps among the camera companies. Curiously, despite the somewhat poor video specs, the camera has an external microphone port. There's a small pop-up flash (GM 5m), and flash sync speed is a slow 1/180 with no higher speed support at all. 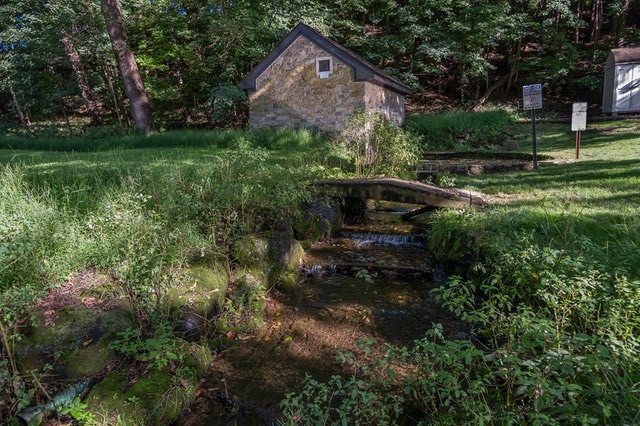 Yes, there's bracketing, different metering modes, some special automated scene modes, and an in-camera panorama mode (set via Mode dial). Max mechanical shutter speed is 1/4000, but the camera will go to 1/32000 with electronic shutter if necessary. Battery life is rated at a decent 430 shots CIPA, and uses the NP-W126S battery. 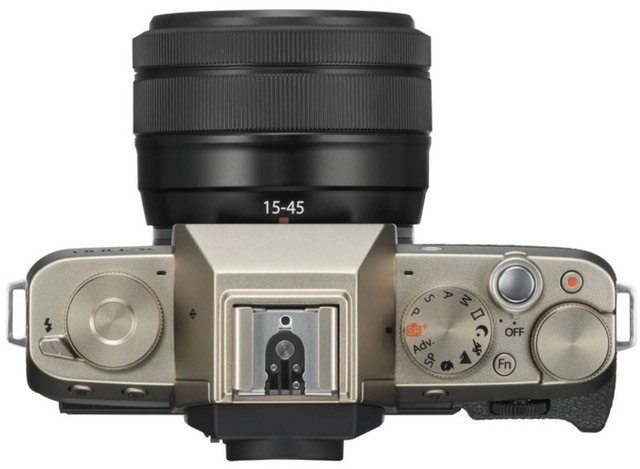 At 448g the X-T100 is one of the heavier "small" mirrorless bodies with an EVF (e.g. the Canon M50 and Olympus E-M10m2 are lighter), but it's still pretty trim, and is actually just a bit smaller in volume than the Olympus. Since we're talking about comparisons, the X-T100 is pretty solid in features other than the video specs when put against any of the lower-end mirrorless cameras from Canon, Olympus, Panasonic, or Sony. It also has one of the lower list prices. There's no weather sealing claim, and while the camera has some of the feel of a metal body, I don't think there's a lot of there there. This appears to be a design more like the original Olympus m4/3 cameras, where the metal is minimal, not a rugged, inflexible structure. The X-T100 sells for US$600 body only, or US$700 with the 15-45mm f/3.5-5.6 compact power zoom. The camera is made in Indonesia. First, attach the small little bolt-on hand grip that comes with the package. Without it, the camera becomes a leather-covered soap bar that's tough to hold solidly. I guess it's good that Fujifilm's included that little chunk of plastic, but I don't understand why they didn't just design the body that way. Unfortunately, that add-on grip is a bit indicative of the time Fujifilm spent to lock down the camera's design. The function (and record video) button are impossible to find with gloves on, and tough to find with gloves off. The dedicated buttons instead of a Direction pad means that it's easy to accidentally reset the camera when handling it in and out of a bag. There is a lock mode for those buttons, but that's inconvenient to use. There's also not a lot of customization you can do for the buttons and controls: basically one dial and one button and what's on the Q.menu (quick menu). While the rear LCD is a touch screen, there's not much reason to touch it. Neither the menus nor the Q.menu can be set via touch. Makes me wonder why they spent the money on the touch capability. Overall, the handling just isn't up to the level of the higher-end Fujifilm cameras: the design crew was taking shortcuts (or a nap) when they drew up the X-T100. And forget about back-button focus techniques. There isn't a back button to assign. That's not to say it can't shoot decently. In some ways the X-T100 reminds me of the Nikon D3500 DSLR: the designers didn't think much of their target customer's capabilities, so they just punted on customization and went for least common denominator and minimal choice in control designs. That means that you adapt to the camera; the camera does not adapt much to you. For a beginner camera or a casual use camera, that's probably okay. But the handling is one place in particular where you'll feel like you might outgrow the camera fairly quickly if you're a more sophisticated user. Battery: the battery life has been decent. I get perhaps 500 shots per charge out of it on average, which is somewhat better than the CIPA rating, and enough for the kinds of uses you're likely to be using this camera for. Autofocus: if video was the feature let-down on the X-T100, autofocus is the performance let-down. From Fujifilm's marketing I was expecting something more along the lines of the X-T20 and higher end cameras they make. Nope. There's a noticeable lag before focus acquisition happens, and sometimes an over-and-back focus shift before the indicators go green. Face detection takes time for the camera to find, and it doesn't always find faces at angles or in low light. Low light isn't terrible, though. What is terrible is any kind of subject tracking. This is not a camera for taking photos of fast moving, or erratically moving objects. For static and relatively slow motion subjects, you probably won't be upset by the performance, but it's decidedly below that of many other entry mirrorless cameras, and much more like what I'd expect from a decent compact camera. Image quality: the star of the performance section is the sensor. I've already said lots of fine things about it in my X-A5 review, and all those good things remain present here. The JPEGs look like the usual punchy Fujifilm JPEGs, the raw files have the usual Sony-sensor high dynamic range and low noise attributes. Low light and deep shadows are handled decently, about as good as any APS-C sensor camera. I probably wouldn't push out to ISO 6400 (and certainly not further) if I could avoid it, but with care, you can get quite decent results out that far from base (which is 100). Note that Auto ISO does not have a shutter speed minimum setting, so be careful when using that. Coupled with Fujifilm's usual excellent lenses, the image quality you can get out of this little faux DSLR is as good as any APS-C DSLR. No complaints at all there. The image quality is the highlight of the camera, just as it was with the X-A5. 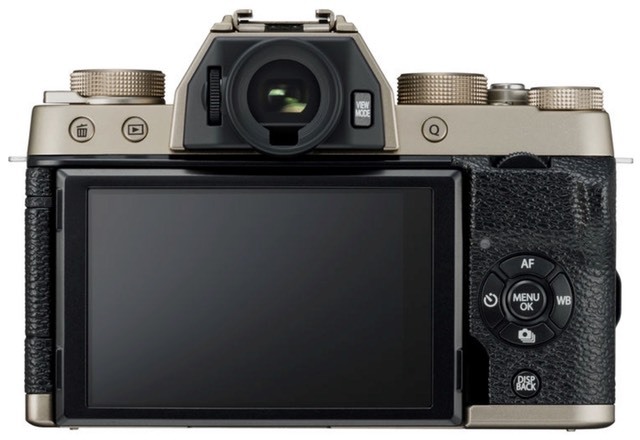 Here's the problem with the X-T100: it's stripped teaser model. Given that the body is almost the same size as a Sony A7m3, you aren't buying the X-T100 for performance, features, or size. You're buying it because a camera that size with decent basic features that can take excellent photos is appealing for the price. You do get a small pop-up flash, you do get what looks like classic SLR-style camera, you do get a lot of basic things. But when you start heading down the path of close examination, you find that you thought you were buying a well equipped low-end Toyota, but instead got the lowest end, lowest cost Korean competitor. Some important things had shortcuts applied. Build quality, for one, was worse than on my X-A5, which was surprising. The battery compartment door isn't held snugly, the Direction pad buttons were "fiddly", the camera came in the box with the flash accidentally popped up and seems to pop up too easily, and the right connector compartment door seems loose compared to my X-A5. The one exception is that the dual-tilt rear LCD support seems pretty hefty for the price point. Everything else feels "stripper." Fujifilm's choices for controls are not optimal, either. No way to perform back button focus makes this camera problematic, particularly when it does the over-and-back thing in continuous focus tracking a lot. Focus performance is on the poor side compared to competitors, despite the claim of PD focus points. The X-T20 is a big step up from the T-100, in controls, performance, and price. The T-20 has better advanced controls, a slightly lighter weight, faster focus, real 4K video, and Fujifilm’s X-Trans sensor. But it’s also US$300 more expensive (body versus body). 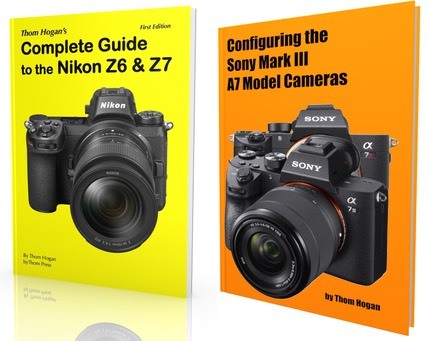 Thus, the real question is whether you’re buying an entry level camera almost solely on price (T-100) or trying to buy some additional performance and control for a higher price (T-20). Fujifilm hasn’t made this an easy decision, as the price points are fairly wide apart, and the X-T100 does have one thing that the X-T20 doesn’t (the Selfie orientation LCD capability). Moreover, the Bayer version of the sensor on the X-T100 is, in my opinion, easier to get great results from for raw shooters. I wanted to like the X-T100 more than I ended up doing. It really only needs a few tweaks to make it the Spotmatic for current times. And we all loved the Spotmatic, as it was dead on simple and reliable, a great starter camera. 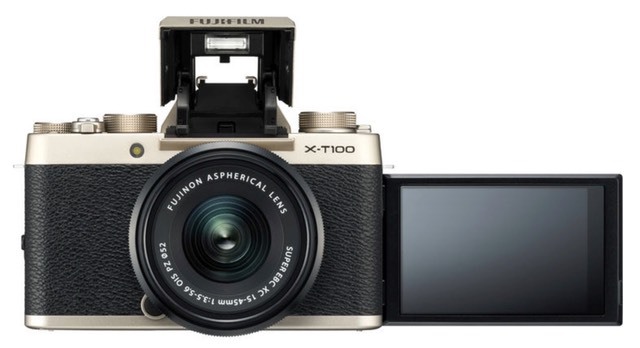 But as the X-T100 comes, it isn’t quite there. The focus performance was on the disappointing side, the 4K 15 fps means that it doesn’t have 4K video, and the build quality is definitely lower than Fujifilm’s better offerings. If you can live with these limitations, the image quality is there. But if Fujifilm meant this camera as a way to get people to sample their offerings at a low price, they shot themselves in the foot: the image quality will be what they wanted, but the rest of the performance and build quality will put people off, not turn them on.